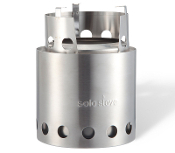 The Solo Stove™ is the ultimate backpacking stove - a lightweight, compact, efficient eco-friendly wood burning stove that incorporates a secondary combustion for a more complete, efficient and cleaner burn. The bottom vents draw air in to feed the primary combustion at the bottom of the stove while hot air rises up the double walls and out the top vents resulting in a secondary combustion. The Solo Stove doesn't just burn wood. It actually cooks the smoke out of the wood and then burns the smoke not once, but twice! Our unique design requires less fuel than regular wood stoves and produces a hotter fire with minimal smoke. 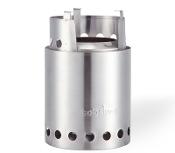 The Solo Stove is a must have for all serious backpackers, survivalists and campers.